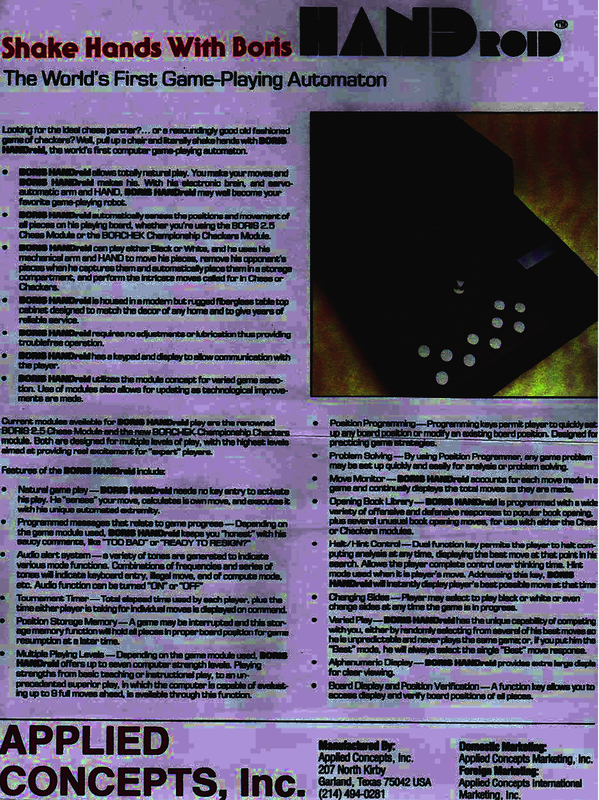 Additional Information: This article was previously published in the computer chess magazine ‘Selective Search’ issue 143 (Aug-Sep 2009), by Editor Eric Hallsworth. The photos are provided by Rolf Bühler and Hein Veldhuis (www.schaakcomputers.nl). 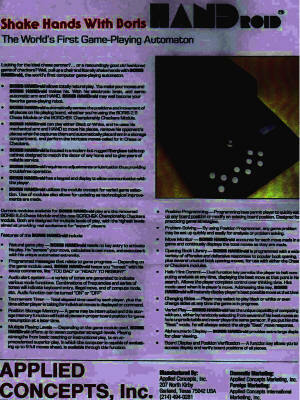 This article is published with the express authorization of its Author and its original Editor. Over the years, many articles have been written about the Novag Robot Adversary, a chess robot with an arm to move the chess pieces all by itself. It appeared on the market in 1982 and only 2000 units were manufactured by the Hong Kong Company Novag. Two years later, due to the susceptibility to technical trouble, Novag decided to cancel the production. Nowadays there are only a few chess computer collectors in the world who are in the proud possession of a good working Robot Adversary. If you didn’t buy the robot when it was on the market, there still is a (very small) chance to get it now by eBay, or maybe if you have good contacts with the big chess computer collectors. Luckily, in November last year (2008), Novag came with the 2Robot, a very appropriate name for the successor of the Robot Adversary. 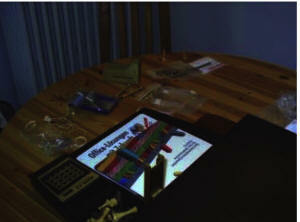 This little brother is also able to move the pieces with an arm and is much cheaper to purchase. Is the Novag Robot Adversary the first commercially available chess robot ever? The answer is yes, but is it also the rarest chess robot in the world? We have to say no to the last question, because in 1980 a chess robot had already been made, but it never was taken into serial production. Only a few prototypes still exist, and in Europe we only know one person who owns one of these prototypes. We are going back in time, to the year 1980. On 16 September exactly, the German chess player and publicist Hans-Peter Ketterling from Berlin is in a hurry to be in time for the presentation of a brand new chess robot. This robot, named the Boris HANDroid, will be introduced at ´Sandy Electronic´, the German importer in Munich. That day would be a very special day. The robot could not only play a game of chess, but was also able to move the pieces completely independent with a special grasping arm. 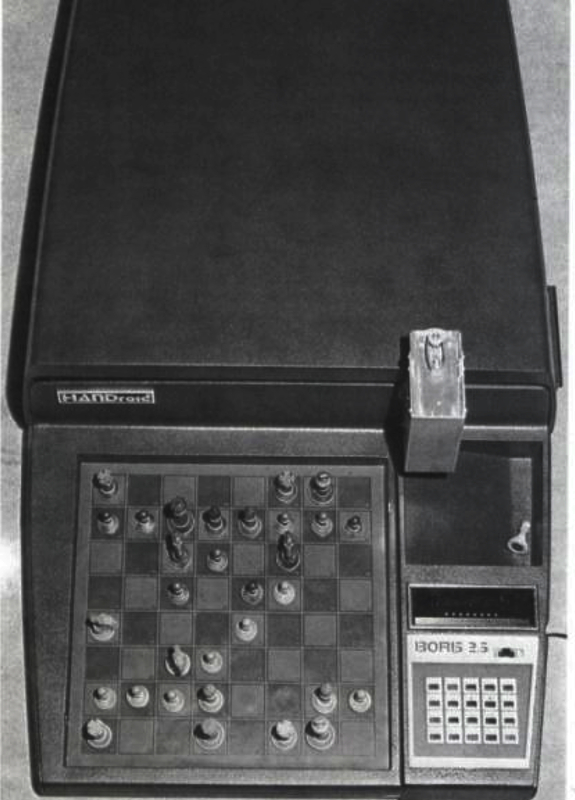 Together with reed contacts on the 64 squares of the 25 x 25 cm sized chess board, the HANDroid precisely registered all the moves of his opponent. The robot was predestined to become the first commercially obtainable chess robot for the public and was planed be available just before Christmas for a price around 3000 Marks (1534 Euros). 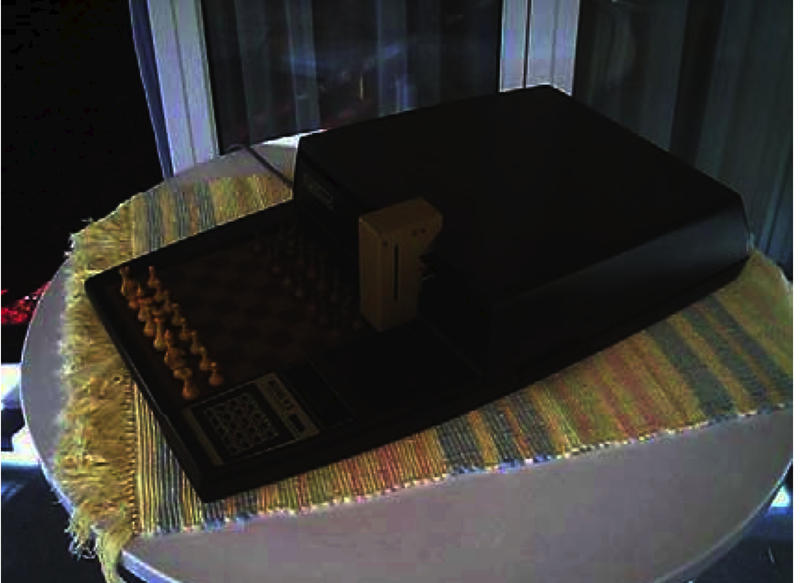 Hans-Peter Ketterling was, just as all the other visitors, very impressed with this chess playing machine. He was honored that Sandy Electronic allowed him to play a game against the Boris HANDroid. Unfortunately, after 13 moves he had to adjourn the game because there were so many others who wanted to play against the robot too! At home, Hans finished the game with the Sargon 2.5 MGS (Modular Game System) chess computer, which has the same program as the robot. In Munich, at Sandy Electronic, the Boris HANDroid played very strong and, with his grasping arm, beat most of the visitors. The Sargon 2.5 program was written by the famous programmers couple, Kathe and Dan Spracklen, at the time living in San Diego, California (USA). The hardware of the robot was made by ´Applied Concepts´, established in Texas. At the presentation in Munich, the visitors could order the robot on the spot, so that they only needed to wait another three months to collect their Christ-child. Of course, this brand new robot was to be marketed as an exclusive luxury article and therefore not available in ordinary department stores. 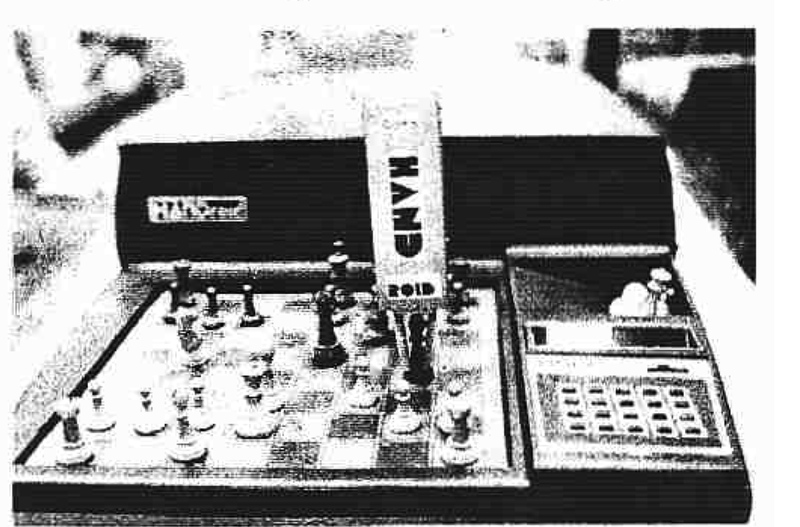 In the last quarter of 1980, several advertisements appeared, in which the robot was praised as the ideal chess partner, directly coming from the 21st century…! Three months later, a few days before Christmas, the people who had ordered the robot in September at the presentation in Munich thought that they could finally put their marvelous machine under the Christmas tree and show it to their family and friends. But the Boris HANDroid did not appear! Maybe there was a delay in the production of the units? 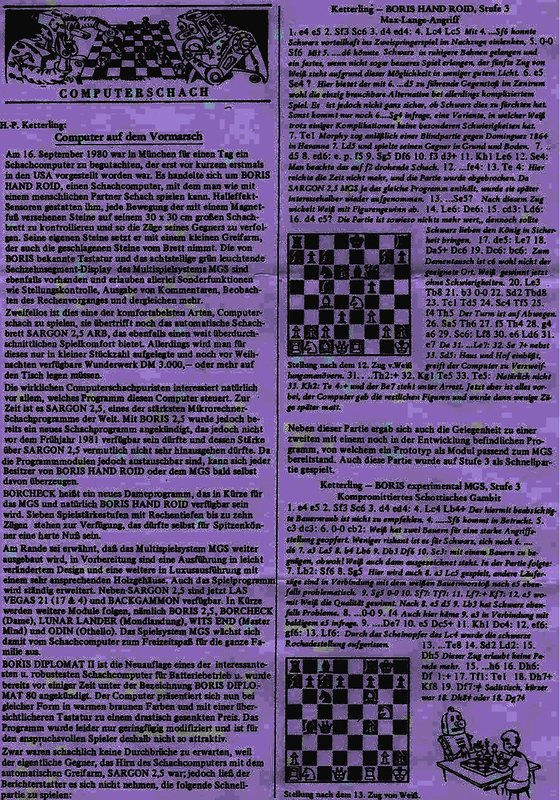 In 1981, the German writer Björn Schwartz published a second supplementary book about the commercially available chess computers. The book also included a description and a picture of the HANDroid. This gave the public a little hope that the robot might still appear on the market. That hope became an illusion. Boris HANDroid was never released and everyone that had ordered the robot the year before was sitting at home empty-handed. 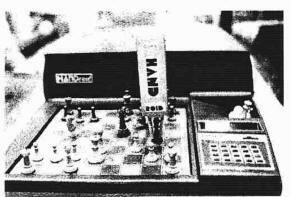 Hans-Peter Ketterling, well-known for his various chess publications, was given the chance to buy the prototype that was presented at Sandy Electronic in September 1980. However, the price asked for the unit was: ´17,000 Mark (8692 Euros)!´ Unfortunately, that price was much too high for Hans-Peter, so he was unable to add the chess robot, which would become the rarest chess robot ever made, to his enormous chess computer collection. Hans-Peter does not know what happened with the prototype or where it is now. There are rumours that Applied Concepts only produced five prototypes. One unit is believed to be in Denmark and a second one was sold at an auction in London for 10,000 dollar to somebody in Japan. The big collectors had already reconciled themselves with the fact that they never would be able to obtain one of these prototypes. 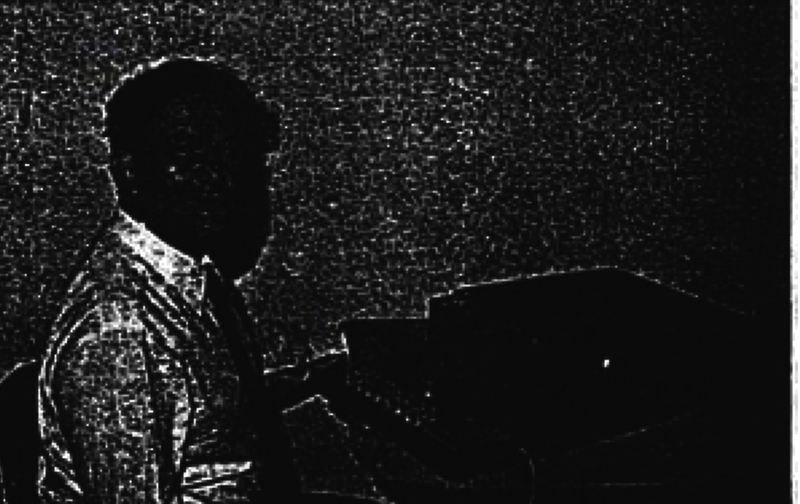 At the beginning of this century a lot of the collectors kept themselves informed through the website of Kurt Kispert from Vienna (www.schachcomputer.at). 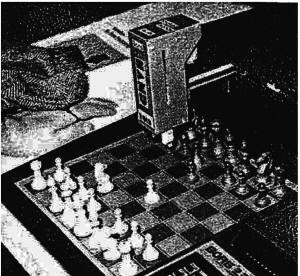 In 2002, Rolf Bühler from Zurich (Swiss) asked at Kurt’s forum why his chess Robot, a Boris HANDroid, never was mentioned in the lists of the big collectors. Was Rolf the only one who had such a computer? 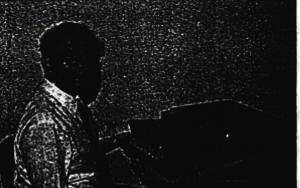 To make his claim credible, he sent some photos of the robot to Kurt, who put them on his site directly. The chess computer world was shaking on its foundations! Rolf was very surprised, receiving many exciting e-mails from collectors all over the world. Because of all the reactions, he began to realize that he was in the possession of a very rare chess robot. Your author was very curious to hear the real story from Rolf himself, so I asked him to reveal the mystery around the Boris HANDroid. With great pleasure, Rolf took this opportunity to tell his story for Selective Search. In the last century, at the beginning of the eighties, I worked as a gardener for the Siemens Company in Zurich. There I met a lot of technicians and became friends with the deputy manager who maintained good contacts with a subsidiary of Siemens, Video Sonic/Rexton AG. This company represented the company Fidelity Electronics from Miami (USA) in Swiss. 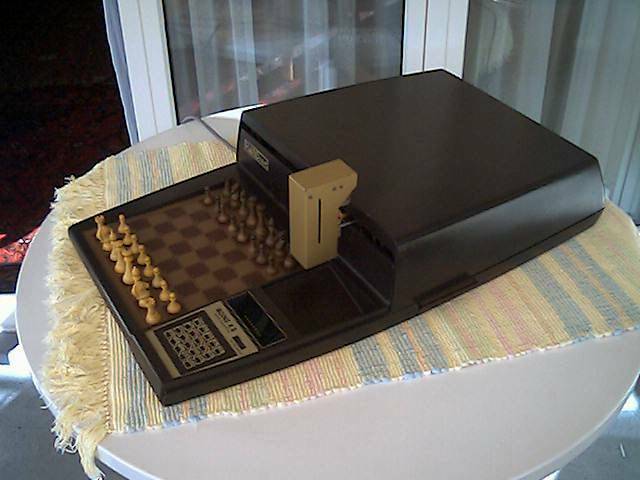 They imported several models of their chess computers. The deputy manager of Siemens brought me into contact with the managers of the purchase department who were responsible for the import of the Fidelity chess computers. Because of this, I bought there my first chess computer, a Fidelity Chess Challenger 7. 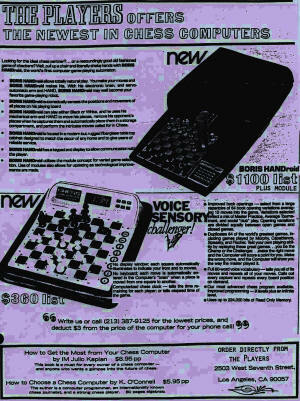 My interest for chess computers increased, also encouraged by all the good contacts with the employees of Video Sonic/Rexton. Soon, I bought all the available Fidelity computers of that time, and in 1980 I discovered that their strongest model was the Chess Challenger Sensory Voice. I noticed that Fidelity’s competitor, the company Applied Concepts from Texas (USA), already had come out with a new chess computer, the Sargon 2.5 MGS (Modular Game System) which was at least equally strong as the Sensory Voice. 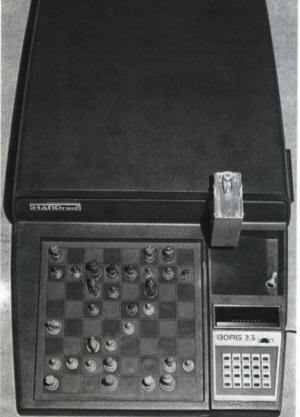 Applied Concepts claimed that their Sargon was the strongest chess computer available on the market. A few days later, at Siemens, I kept my eye on an advertisement in which a colleague offered the Sargon for sale, because the computer was much too strong for him to play with. I didn’t hesitate for a moment and bought his computer immediately. In this way, I came into possession of the two strongest chess computers of that time. Because I was also interested in their new small travel model, the Boris Diplomat, I contacted the importer of Applied Concepts in Zurich, a company called Pool-Tec AG. Some days later, I visited this company. I had a chat with one of their representatives and I told him that Fidelity claimed their Sensory Voice as the strongest available chess computer ever made. The representative encouraged me to test the Sensory Voice with the Sargon 2.5 with special positions and tournament games to find out who really spoke the truth about their claims for the strongest computer. After many tests, the Sargon seemed to be the strongest one. Two years later, in 1982, I visited Pool-Tec again and saw two exactly identical chess robots standing there in a corner, that both had an grasping arm to do their moves completely independently. I was totally fascinated and asked the representative if they were for sale. He told me that the two computers were chess robots, named Boris HANDroid and that they were not for sale due to technical reasons. I told the salesman that I would love to buy one of them, in fact I almost begged the man to sell me one of the robots. He told me just to wait for a while, but a few days later, he called me to say that I could come along to collect a Boris HANDroid. Of course, I had my ears wide open and drove to Pool-Tec at once. This is how I became the new owner of this famous and very rare chess robot. 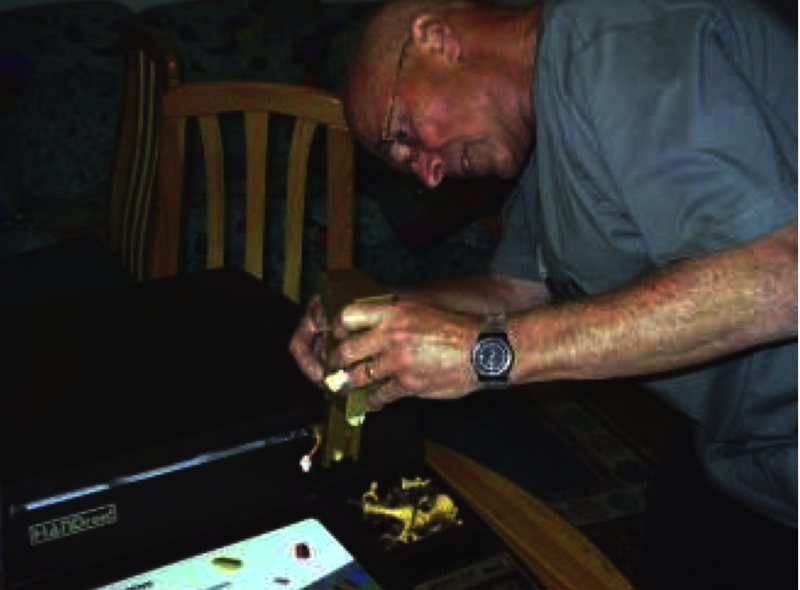 Fortunately, my retired neighbour, Mr. Ernst Rütti, who used to work as a technician at the company NCR, has a lot of electrical and mechanical knowledge. He informed me very well about the working of the robot’s grasping-arm. Once a year he checks the robot and repairs broken parts if necessary. He explained to me that the power force of the arm is driven by three so-called Servo engines and special gearwheels which are responsible for the way the robot-arm is moving in a notional X/Y and Z-axis. With these axes the arm is able to move itself correctly forwards, backwards, up and down, to the left and to the right to grab and move the chess pieces. Ernst Rütti repairs the Boris HANDroid! Every time you want to play a new game with the robot, the engines and the gearwheels have to turn the arm in the correct angle. The arm vibrates for a long time until the angle has been found. 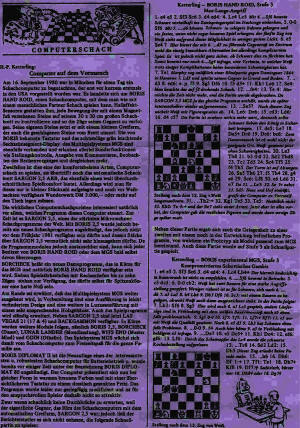 This makes a loud ticking noise, so that it is almost impossible to play chess after 22.00 hours! Maybe the manufacturer could have improved this by making a special switch for it. I think the starting position of the arm could then be found much faster. You can compare it with a printer who brings the ink-cartridges back in the correct position automatically. The biggest wear in the arm is a little snare that connects the engines with the mechanism of the arm. Not so long ago, I checked it and noticed that I had to replace it. I know a company in Zurich which is a specialist in selling parts for modelling and I usually buy a new one there. If the robot is no longer able to grab the chess pieces correctly, then the problem always lies in the mechanism of the arm. In the arm are two bars which are responsible for lifting the chess pieces up- and downwards. The bars are driven by the engines, the gearwheels and the little snare. After a few games, these bars tend to bend themselves a little and because of this, the HANDroid is not able to grab the pieces properly anymore. Then I have to manually bend the bars back to let it work correctly again. That is a nice job for the real mechanics-lovers, but certainly not for people who are only interested in playing chess with it. I think this is the main reason why the Boris HANDroid never appeared on the market. The same as his cheaper brother, the Sargon 2.5 MGS, the Boris HANDroid is equipped with the possibility to exchange the program module. 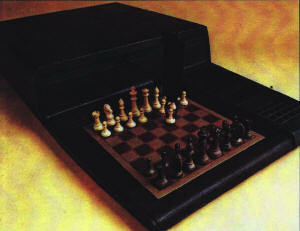 This makes it possible to not only play chess with the robot, but also other games like draughts. If a new and stronger module comes on the market, you only have to buy and replace it with the old one. 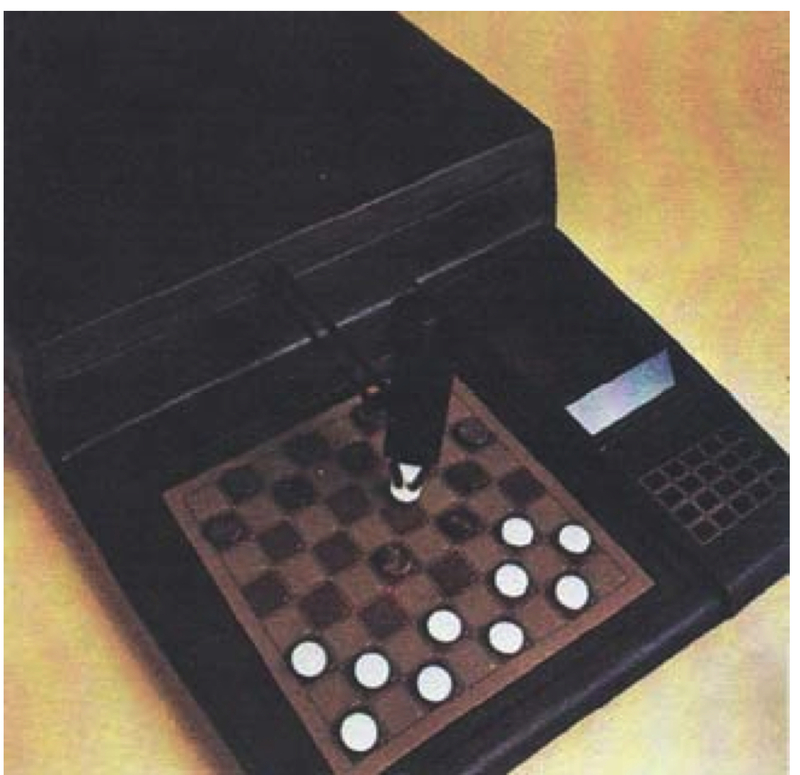 I don’t believe a draughts module ever appeared, because the robot had already too many difficulties playing chess and moving the pieces properly with its arm. A funny thing to mention is that whenever I win a game, the arm goes forwards and stops above square e1 for a few seconds and then goes back to its starting position. It looks as if the robot wants to shake hands with me...! Not so funny is the fact that some time ago, I met the representative of Pool-Tec again, whom I bought one of the two HANDroids from. At this new encounter, I asked the man what happened with the other HANDroid. He told me that one year after our first meeting, he gave the robot to the garbage collector...! I found this incomprehensible but I think he did regret it very much. Nowadays, I only play a few games a year with the robot. Due to its vulnerability for technical troubles, I think the Boris HANDroid should stay forever in a showcase of a museum. Maybe, some day in the future, I will lend out the robot for an exhibition in the Swiss computer museum. 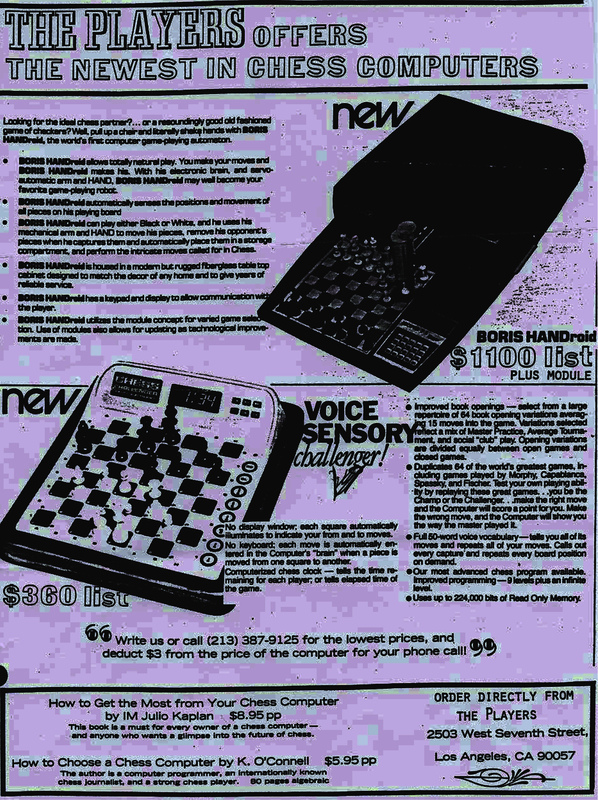 I’m glad that I was able to tell the Selective Search readers my story of the very rare Boris HANDroid chess robot that should have been the first available robot with grasping arm on the commercial market ever. Unfortunately, it never appeared and it has been a mystery for years what happened to the machines. Well, I only know there were two of them, because I have seen them myself at the Swiss company Pool-Tec. Are there any other units left on this planet? I don’t know, but I do hope you have enjoyed my story of the HANDroid of which I’m the proud owner!